I think we can all agree that the internet is a rank cesspool of bitterness and poison and no one should ever, ever look at it. But, on the other hand, I think we can all also agree that the internet is a magical Vegas buffet heaping with joy-shrimps and a communal fountain of human spirit fondue. So what are we supposed to do with it? How do you live in this thing every day without turning into a sour goblin? One entrepreneur thinks she's come up with a solution to internet darkness. 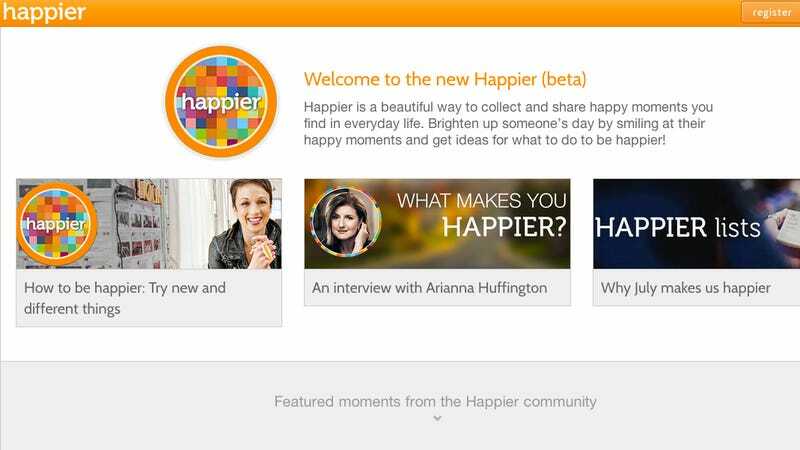 Nataly Kogan founded Happier, a new social networking site designed only to highlight users' "happy" moments. It's basically Delilah: The Website. Think of it like one of those radio stations that feature “love songs, nothing but love songs.” Happier is meant to be a place for photos and status updates about things that make its users happy — pulling off a headstand in yoga class, say, or seeing a butterfly. No happy moment is too small, and no negativity is allowed. ...While you can do that on Facebook or Twitter or on photo-sharing sites like Instagram, she argues that those sites are so broad that users feel like they have to make an impression with each item. The small moments of joy can seem too trivial to post. Now. Excessive self-editing certainly isn't my experience on social media, but I'm willing to believe that other people and their friends are more discerning than me and mine. I guess. And I genuinely do think that the internet could use more positivity (or, at least, that we could filter our experiences in ways that are better for our mental health). I completely believe that Happier's heart is in the right place and that certain people might find it a fulfilling social experiment. But I also have some questions about Happier. Social media is already rife with insincerity, and I'm skeptical of the drive to encourage even more cultivated and hollow online personas. Who's responsible for flagging "unhappy" content? Who decides what qualifies as "happy"? "Happy" isn't objective. As a friend astutely put it, "'happy' is a marketing tool," and perpetuating and validating that marketing tool might not be particularly constructive for the world at large. The pressure to strive, daily, for some diaphanous ideal of happiness keeps a lot of people feeling like miserable failures (and, duh, buying stuff). I think I'll keep my emotions mixed, thank you.